Gadget Guard provides products that protect against wear and tear, without sacrificing the look and feel of your electronic device. When developing the packaging for the Black Ice Edition of their iPhone display guard, they came to Do-It Corporation for an attractive, sturdy hang tab. Gadget Guard Tempered Glass Display Guard products hang in AT&T stores throughout the United States. 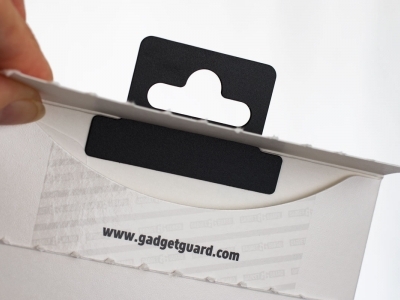 Gadget Guard’s iPhone packaging includes a black R-JAG ejected hole hang tab. The hang tab adheres to the inside of the paperboard sleeve and extends through a die cut opening at the top of the package creating a strong and secure hanger. The black hang tab provides visual contrast and nicely complements the newly designed white package. Gadget Guard can be assured that a hang tab from Do-It Corporation will keep the product hanging until the product is sold.